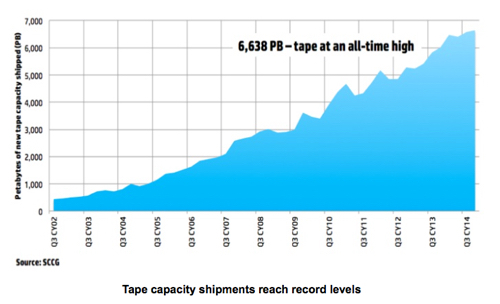 Shipped tape capacity passed 6.6 exabytes in the third 2014 quarter, a record. An HP backup, recovery and archive product manager, Simon Watkins, revealed this in a blog. As a man with lots of tape libraries in his set of products, you’d expect him to be pleased. The data came from the Santa Clara Consulting Group. Watkins also said “LTO-6 tape media pricing fell below one cent per gigabyte” and repeated the general message that tape archives are cheap – much, much cheaper than disk. When data is in a long-term preservation state, then low-cost storage is prioritised over faster access, but more expensive (meaning disk) alternative media. Watkins singles out DreamWorks Animation as sticking its long-term assets on tape instead of keeping them on disk, and thereby saving 15-20 kilowatts per hour for each PB that’s not on disk. Big Data means data growth continues and that's great for LTO format tapes and drives, which have 95 per cent or so of the market. Won’t cloud archive facilities such as Google Nearline and Amazon Glacier mess up the tape market?